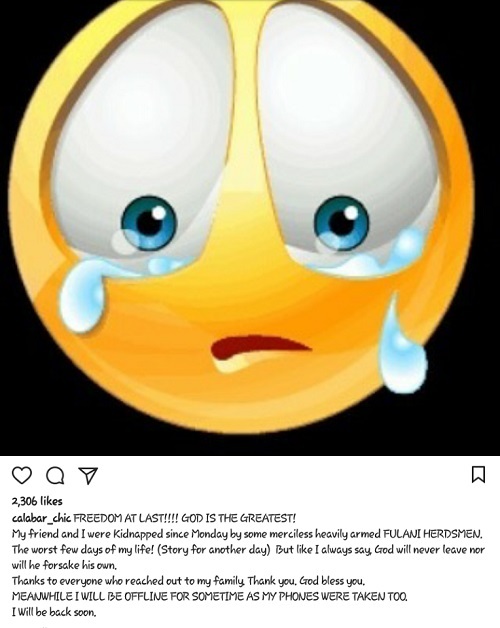 Actress and comedian, Calabar Chic who was reportedly kidnapped by Fulani herdsmen has expressed thanks to God after she was successfully released. The abduction took happened on Monday. She was reportedly released yesterday alongside a friend. "FREEDOM AT LAST!!!! GOD IS THE GREATEST! My friend and I were Kidnapped since Monday by some merciless heavily armed FULANI HERDSMEN. The worst few days of my life! (Story for another day) But like I always say, God will never leave nor will he forsake his own. Thanks to everyone who reached out to my family. Thank you. God bless you. MEANWHILE I WILL BE OFFLINE FOR SOMETIME AS MY PHONES WERE TAKEN TOO. I Will be back soon." Fulani herdsmen have become notorious for criminal activities in recent times. Just some days ago, about 73 people were massacred in Benue state by herdsmen who attacked villages using AK47 guns and machete.